Are You Up For A SALON EXTREME 21 Challenge? SALON EXTREME 21: “The Toughest, Most Extreme Salon Marketing Program Ever Put Down On Paper. And probably the No. 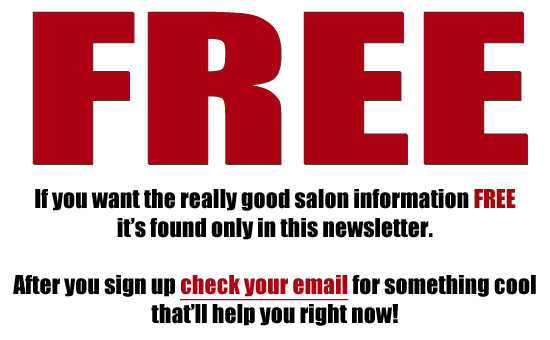 1 Salon Marketing Guide On The Planet! Are You Ready To Try Something More Extreme With More Results For Your Salon? Register For FREE Expert Tips or Keep Reading! IMPORTANT: The SALON EXTREME 21 manual will not be available as a download ever. This is a DESKTOP training manual designed specifically so you get the results you deserve. It is a hard large book with nearly 400 pages and is delivered to your doorstep. We have NO plans to go digital with this book. It is for serious salon owners that want results only! If that’s you you’ll order and wait excitedly for your delivery regardless of the time it takes to arrive. I started my hairdressing career when I was 15-yrs old. I got my first salon when I was 23-yrs and had 3-salons for almost 20-yrs. I spoken to salon owners all over the world about marketing. Today I work with over 400 different business as a premium marketing advisor. I’ve saved hairdressing salons from closing and built huge salons from the ground up. One salon owner I worked with used EXTREME and got EXTREME results of over 53.4% and 116% increase in salon business. Another had over 400 new clients from one EXTREME campaign. This stuff is ridiculous – it works! When I decided to create SALON EXTREME 21 fast-track marketing I knew it would produce extreme results – fast – in 21-days fast because I have been doing just that for just over 30-yrs now for my clients all over the world for decades now. And it does but are you EXTREME enough, strong enough and committed enough to try it? Are you brave enough to pack out your salon with new clients in hours? Are you brave enough to run around like a headless chicken for 21-days. Are you brave enough to take the lead in your salon and actually be the person that makes things truly happen. I’ve taken over 30-Years of everything I have learnt about the salon business on the front-lines, the shop-floor and working with salon owners just like you. It works! This isn’t about new marketing and the latest fad and this isn’t about old marketing that is slow. SALONE XTREME 21 is about what will work for you right now, today and works extremely fast. A YEARS CLIENTS IN 21-DAYS THAT’S FAST! One test with SALON EXTREME 21 brought in one salon owner over 400 new clients from a single promotion! The results you will see really will speak for themselves. So If You Think You Need Just Facebook To Get Your Salon Rammed – Get Over It! Unlike many salon experts with NO SALON EXPERIENCE – I get it, I understand how it is everyday in a salon. For almost 20-years I had 3-salons of my own! I know exactly how tough it is and that feeling when you arrive at your salon open your appointment book and there are more gaps than there are clients. And I also know how hard it is when you really need a new stylist, you finally find one and start them in your salon only to struggle with clients for them and have to find their wage at the end of the month. And I get it when you have a mountain of bills to pay whilst all your team are sitting in the back room, liking, un-liking, blocking posting, tagging and fagging away whilst you freak out over the amount of cash you are taking and the amount of bills to be paid. I Get It Because I Did It And I Understand What It Takes To Fix It! 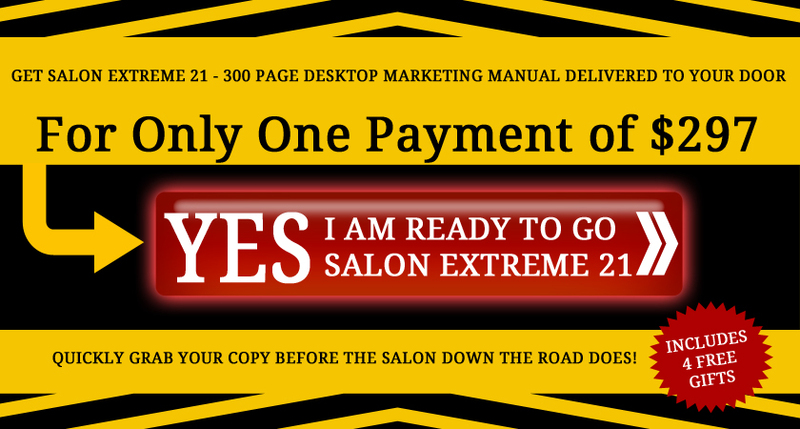 Everything you need to pack out your salon the SALON EXTREME 21 way is in the 300 page desktop manual. Page 244. Why the SALON EXTREME 21 approach to FREE hairdressing never fails! One more thing I have done for you. I have created this manual to be scribbled, written all over with as many notes as you possibly can add. This is a working manual you will put on the deal in your salon so your personal notes will be critical. They are all there for you. And it is important you remember that you as a salon owner – SALON EXTREME 21 is designed also to change things for you. SALON EXTREME 21 is SALON MARKETING made outrageously easy but FAST! BUT …If you’re still not sure that is fine I understand because there really isn’t anyway I can describe how it feels to watch your salon transform before your eyes over a period as short as 21-days. To see clients almost falling out of your door because of the SALON EXTREME 21 program and to see those results transformed into real cash in your bank account. If you are willing to go SALON EXTREME 21 and take just 21-days out of your 365 days this year I promise you there will be a result for you that will blow you away. But you have to commit because this could be the toughest thing you’ve done in your salon yet and if you will commit – this is for you and you will be saying it was worth every last penny. Yes Alan I am ready to go EXTREME – SALON EXTREME 21! Send me in the mail the complete 300 page desktop SALON EXTREME 21 training manual. Plus any free gifts mentioned all for just 1 payments of $297.00. I understand that SALON EXTREME 21 comes with a 30-day money back guarantee as long as I mail back the manual in re-sellable condition. And I am committed to logging everyday down, sharing exactly how I built my salon in 21-days and all the other SALON EXTREME 21 tracks and tips. Once the order is placed, you will be redirected to the order confirmation page to acknowledge your order.